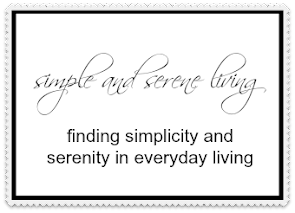 Last week's post about the uber exciting things that go on in my life on a daily basis was so highly sort of popular, so I decided to continue the tradition this week. While taking my walk around my neighborhood the other morning I came across this mailbox, on this corner. The mailbox is what caught my attention. I loved all of the clingy vines, and then I noticed the street sign and I have come up with a plan. 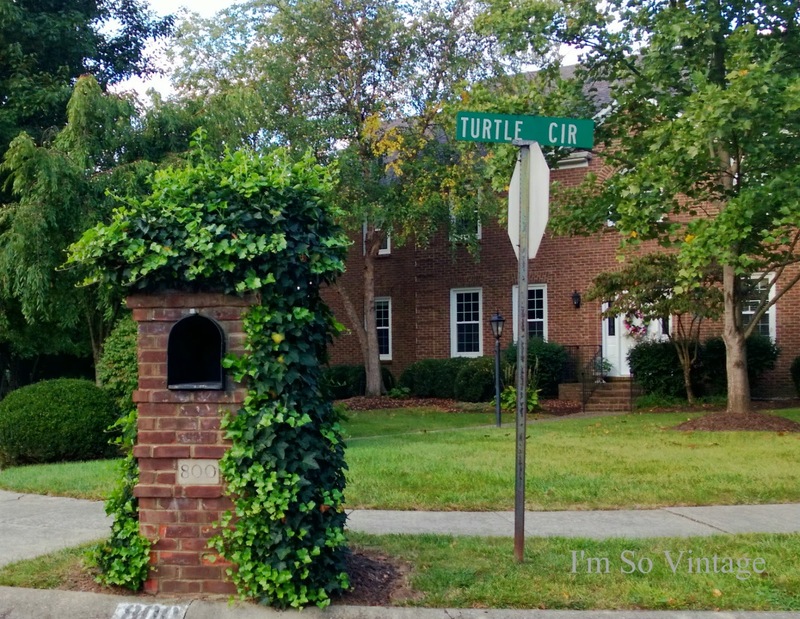 I am going to sneak out early tomorrow and hide behind that mailbox in hopes of seeing a turtle parade. (If the residents of that lovely home decide to call the police, I feel sure I can count on you for bail money). On second thought, I hope a turtle doesn't jump out of those vines and land on my head, because I don't want a photo of that showing up on the front page of the newspaper. My brother-in-law was a columnist and I have had my share of embarrassing details of my life in that paper. I am so over that. The flowers are a lot like me. Clinging to summer weather. I'm afraid that it will soon be a losing battle. I did have a good week of thrifting and yard sale finds. These are just a few, most of which will be appearing in my shop. I personally think that is pretty exciting. If you noticed the antique graters in the back, I have a box full of graters and sifters I haven't even gone through yet. Be still my heart. I've also been doing a little decorating this week. This is a vignette I placed on my window sill. I love when the light reflects off of the bottles. And yes, fall is happening around here. All of my wishful thinking doesn't seem to keep it away. So I guess I will start to do some fall decorating this week. SIGH!!! I LOVE that mailbox. Maybe they keep a snapping turtle inside. Wouldn't that be exciting for the mail carrier? Turtles? Really? How fun! All of your images are Autumn calm and beautiful. I am happy to hear that you are back in your routine and out thrifting once again! Such a beautiful neighborhood to go walking. I love seeing the change in the leaves. We don't get much of that in CA, only a tiny bit near me. The mailbox is so pretty. And the house is gorgeous. You got some great garage sale finds. Gorgeous mailbox - but for some reason I'm in love with the vintage graters even more LOL !!! I saw that aodrable teapot in your shoop yesterday. Love it! Wow that mailbox looks great! Love your daughter's rose too.... Have a wonderful day. Love your neighborhood and I really like the turquoise pyrex dish. Love the vintage bottles. I'll have to check your shop for those. My new love is vintage apothecary jars. They look so pretty as vases and it's fun adorning them with either ribbon or a vintage skeleton key. Congrats to your daughter! 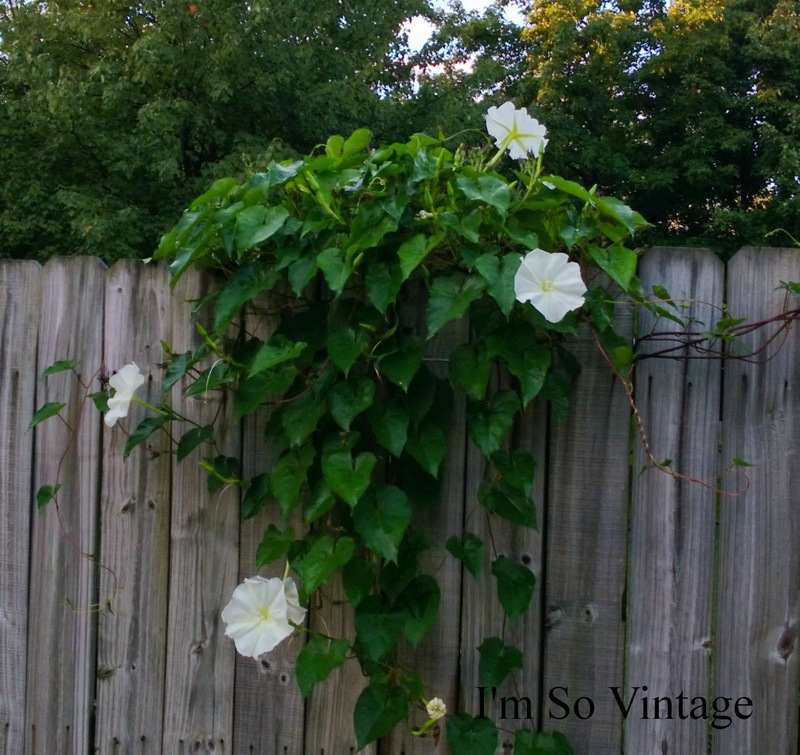 I'm like a vine clinging to summer, too. I pass a purple one --- also clinging to a weathered gray board fence --on my morning walks. LOVE the teapot you scored -- and the bottles. Ready or not, Fall is upon us. I'm clinging to summer....wish the days weren't getting so short! 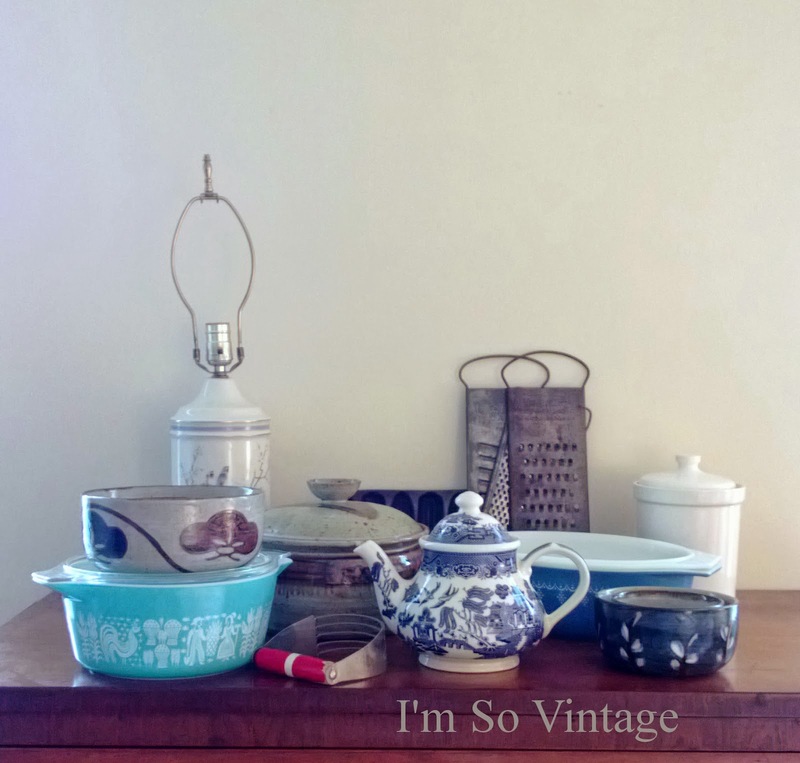 Love your vintage treasures and sweet vignette! Hugs to you! Hi Laura, it's so nice to meet you! 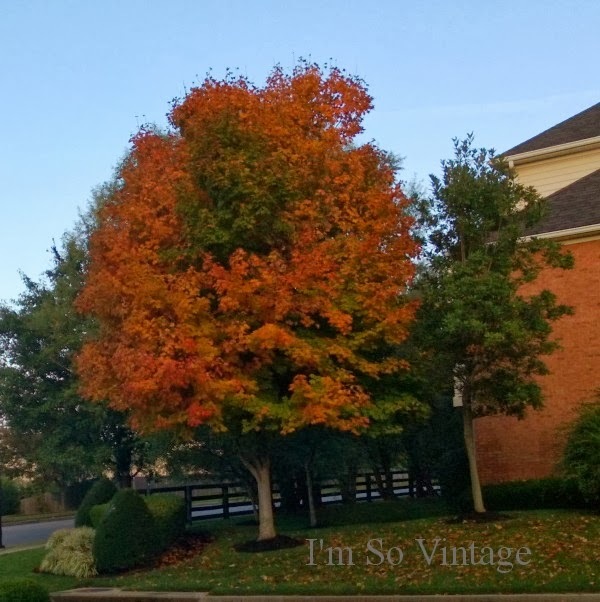 Even though I love fall decor, my favorite season is summer. I love warm weather and would love to live somewhere like California, where there's a lot more sun and warmer weather than here in northern IL! Love the treasures you've found Laura! Your vintage pieces look so pretty the way you've styled them and would be a wonderful addition in any home. It's getting really cold here in WA state and I think we're in for a cold winter.. I love turtles, too! I found the cutest little guy trying to head into the gate house the other day! Your photographs are beautiful! Oh your neighborhood is gloriously beautiful and just sings Fall! 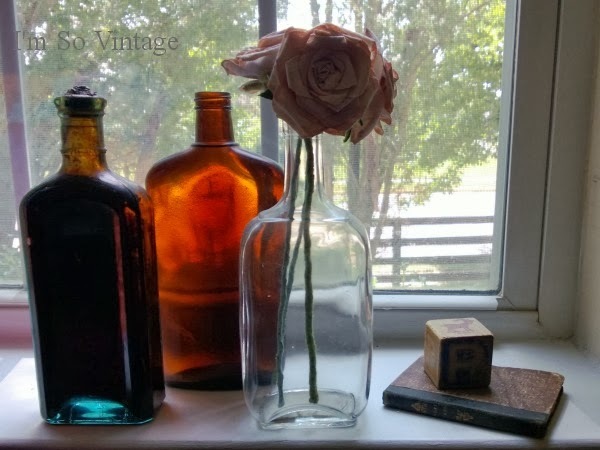 Your Vintage pieces on your windowsill are perfect. I really like the amber and clear mixed together.